When ever i do world q with my Enhanc Shaman, This app tells me i join as a healer. I have never told it i was healer, nor do i heal on this shaman at all. And i'm running latest version of app. It's not supposed to, I believe something changed in how these WQs are classified in game. Right on, wasn't sure if WQs were flagged or just done via a pattern matching lookup table or something. WQGF should not offer to group for "Supplies Needed" quests, such as the Felslate one currently available in Suramar today. title = "The Sleeping Corruption"
tagName = "Epic Elite World Quest"
_ = "The Sleeping Corruption"
_ = "Doing the world quest "The Sleeping Corruption" in Val'sharah. Automatically created by World Quest Group Finder 0.17.2. #WQ:42779#PVE#"
title = "A Dark Tide"
_ = "A Dark Tide"
_ = "Doing the world quest "A Dark Tide" in Highmountain. 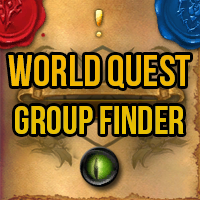 Automatically created by World Quest Group Finder 0.17.2. #WQ:43985#PVE#"
Oh and in addition to my previous statement, I think you should always search in the "Custom" category for everything, too many people do it wrong(TM) and just open groups for quests there. title = "DANGER: Magistrix Vilessa"
tagName = "Rare Elite World Quest"
_ = "DANGER: Magistrix Vilessa"
_ = "Doing the world quest "DANGER: Magistrix Vilessa" in Suramar. Automatically created by World Quest Group Finder 0.16. #WQ:44114#PVP#"
I feel like the name pattern matching is missing a lot of hits, does it only look for the full WQ name or also partial hits? Like the world quest is called "Danger: Mob Name" and it just won't queue me for groups that are called just "Mob". Also for world boss groups, can you also search in the "custom" category since maaaany people open the groups for them in it? Looks great, my defective eyes thank you. Love this addon, thanks for adding the pvp option. Minor request, could you pick a different background to put behind the current WQ, or give us an option to turn it off? The current light brown one makes the text very hard to read, something darker would provide better contrast. I like your message "Don't forget you're playing with human beings. Be polite. Say hello and goodbye when joining a group." To that end, can we get an automatic group message box? It was supposed to be fixed in 0.13.1, when did it happen to you?